famine – Sara S. Goek, Ph.D.
‘The Irish Famine in Historical Memory: A Comparison of Four Monuments’, from The Dustbin of History, 1 April 2013. Though without doubt a seminal event in Irish history, the meaning and memory of the Great Famine of 1845-9 remains contested. It is estimated that over 1 million people died and 2 million emigrated and it catalyzed emigration for the rest of the century. While historians debate exact figures and the evolution of the historiography of the event, its complex legacy in historical memory, especially across the vast diaspora, remains underemphasized. A comparison of four memorials, one in Canada, two in the United States, and one in Dublin, offers some insights. As Ian McBride writes, ‘we need to scrutinize collective myths and memories, not just for evidence of their historical accuracy, but as objects of study in their own right’. These monuments are a physical manifestation of those ‘myths and memories’ and can be read as visual, cultural sources. First, an introduction to each monument, then some reflections on them. Opening ceremony in 1909 for the monument on Grosse Île. Photograph: Wikimedia Commons. A 46-foot high Celtic cross stands at the highest point of this three by one mile island in the St. Lawrence River, thirty miles downriver from Quebec. Grosse Île served as a quarantine station for incoming immigrant ships from 1832 and witnessed the terrible devastation wrought by famine and disease on the ‘coffin ships’ that brought Ireland’s destitute to the New World in the late 1840s. Michael Quigley estimates that between 12,000 and 15,000 from the Famine era are buried here. This monument, the first of its kind, was paid for by public subscription raised by the Catholic, nationalist organization the Ancient Order of Hibernians (AOH). It was unveiled on 15 August 1909 in a ceremony attended by 9,000 people, including the last surviving priest who had attended the sick and a woman who had been orphaned there as a young child and adopted by a local family. Now, the whole island is a National Historic Site and many other commemorations have taken place there. Cailleadh Clann na nGaedheal ina míltibh ar an Oileán so ar dteicheadh dhóibh ó dlíghthibh na dtíoránach ngallda agus ó ghorta tréarach isna bliadhantaibh 1847-48. 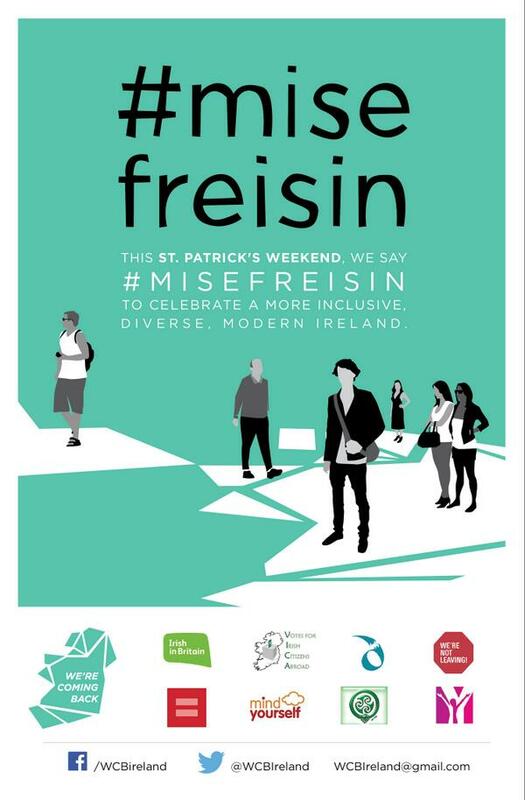 Beannacht dílis Dé orra. Bíodh an leacht so i gcomhartha garma agus onóra dhóibh ó Ghaedhealaibh Ameriocá. Go saoraigh Dia Éire. Children of the Gael died in their thousands on this island having fled from the laws of foreign tyrants and an artificial famine in the years 1847-48. God’s blessing on them. Let this monument be a token to their name and honour from the Gaels of America. 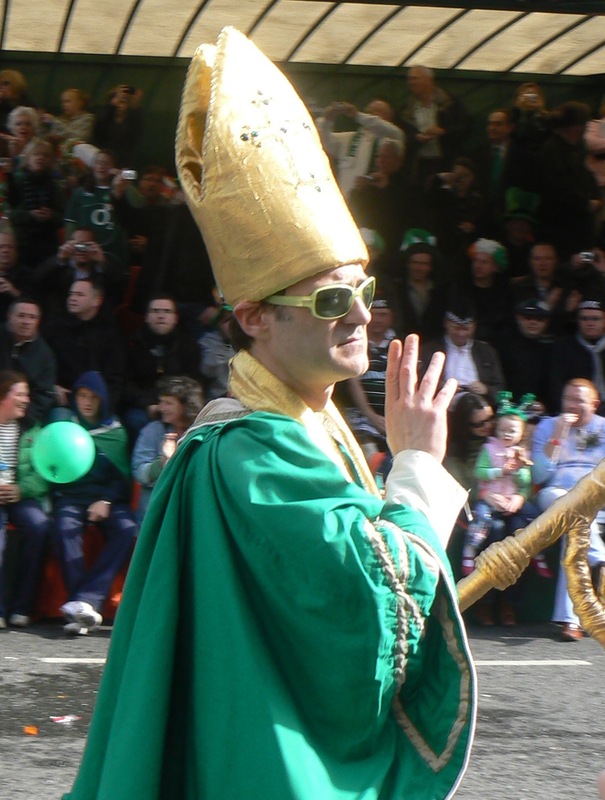 God Save Ireland. Famine Memorial, Boston. Photographs: Sara Goek. This memorial by Robert Shure was unveiled in June 1998 as part of the 150th anniversary of the Famine. It consists of a small round plaza with eight plaques describing the historical context and in the middle of the space are two groups each with three bronze figures, a man, a woman, and a child. In the first group, the man sits, head hanging limp and bones showing through his skin, while the woman kneels looking upward with one arm raised, with the child beside her. They are clothed in rags and emaciated. In the second group, all three figures are standing and they appear in motion, as if striding forward, healthy and well-clothed, but the woman has her face turned back, looking at the first group. Irish Hunger Memorial, New York City. Photograph: Downtown Magazine NYC. Irish Hunger Memorial, New York City. Photograph: Wikimedia Commons. Designed by artist Brian Tolle and opened in 2002 this is perhaps the most ambitious and diverse of the four memorials here. The structure looks like an Irish hillside. A passage under it is reminiscent of ancient tombs like Newgrange. Above, the landscape incorporates the ruins of a nineteenth-century stone cottage from transported over from Mayo, surrounded by native Irish plants and inscribed stones from every county. From the top visitors look out over the Hudson River and the Statue of Liberty. The sculpture sits on an valuable piece of real estate, to south is the New York Mercantile Exchange, and the artist says that seen from this context it’s ‘an extraordinary thing’ that visitors ‘look out on an abandoned Irish field that’s here to commemorate a traumatic event in terms of world hunger’. Famine Memorial, Dublin. Photograph: Sara Goek. Erected in 1997, this monument designed by sculptor Rowan Gillespie marks the site of departure of many emigrant ships. It takes the form of bronze figures, all emaciated and ragged, grasping bundles in their arms and walking towards some unknown future. On a wet, gray day, these figures appear eerie and unnerving. I am told that a sound instalation on the site used to play looped recordings of a voice reading lists of the food exported from Ireland during the Famine (though I don’t believe this was the the case when I visited). Nearby is the World Poverty Stone, expressing solidarity with people living in poverty across the globe, its proximity situating the Irish Famine as a lesson for understanding human rights today. Why compare these? What can we learn from them? They commemorate the same event, but in quite different ways and in doing so I think they reveal much about how and why the Famine is remembered in Ireland and the Americas and why its meaning remains contentious. The first, the monument at Grosse Île evokes the ethos of its era, both in standing and inscription: the imagery of the Celtic Cross is one of a grave marker but in a form that brings to mind a Gaelic, Catholic golden age, while the plaque on it ties into the idea of Famine emigration as forced exile and the nationalist interpretation of the event and conditions that produced it as the work of ‘foreign tyrants’. Kerby Miller writes that in the aftermath of the Famine, Catholic clerics and nationalist politicians (both opinions represented in the AOH), ‘generalized the people’s individual grievances into a powerful political and cultural weapon against the traditional antagonist’. In America they did so particularly effectively, not only because of memories of terrible suffering in Ireland and with no choice but emigration, but perhaps also because in the New World they faced prejudice and discrimination, which kept them as a group largely disadvantaged and left them bitter and disillusioned. Nationalist readings of the Famine, represented by the opinions of John Mitchel and the AOH cross at Grosse Île, offered an explanation for their suffering as well as a ‘redemptive solution’ by calling on them to unite in recognition of their proud heritage, made mockery of by both the British government and American nativists. The first memorial thus is both commemorative, marking the last resting place of thousands, and a strong signal of the strength of Irish nationalist sentiments in Canada and the United States. The monuments in Boston and New York convey similar messages, albeit in slightly different ways. 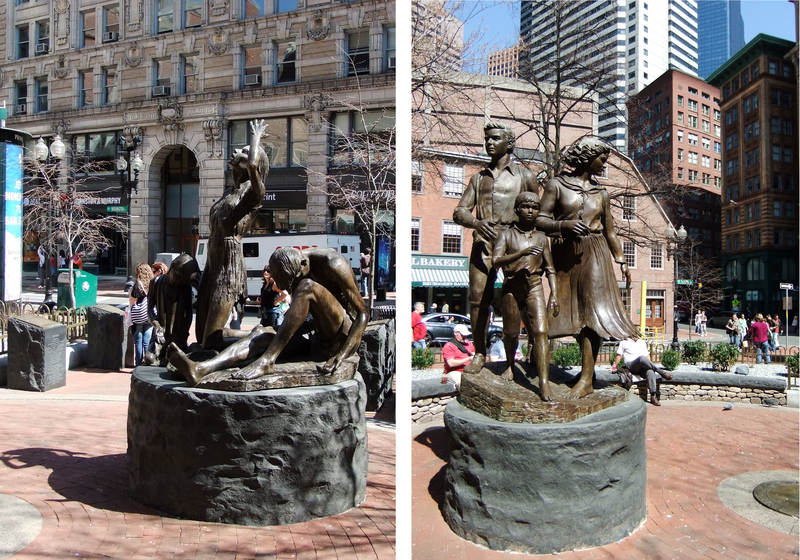 In the Boston memorial, the two groups of figures seem to be of the same people, a ‘before and after’ portrait of emigration. The first group, foresaken and emaciated leaving their native land, the second, healthy and successful in their new lives, though the female figure glances over her shoulder at the former. However, this sort of progress in the New World often took multiple generations and those who succeeded did not always choose to look back at where they had come from, viewing the Famine with shame or as part of the baggage of a past best left behind. Nonetheless, that story of ‘rags to riches’, of ‘No Irish Need Apply’ to the election of John F. Kennedy, has proven powerful regardless of its truth or complications. Not all immigrants found prosperity in America, but the enduring mythology is of those who did. As Kevin O’Neill writes, ‘The Famine provides Irish Americans with a “charter myth” – a creation story that both explains our presence in the new land and connects us to the old via a powerful sense of grievance.’ The Irish Hunger Memorial in New York emphasizes this point: the sense of grievance encapsulated in the abandoned, ruined cottage on an overgrown and rocky hillside, and the presence and success in the new land in the surrounding skyscrapers and view of the Statue of Liberty, the symbol of American opportunity. 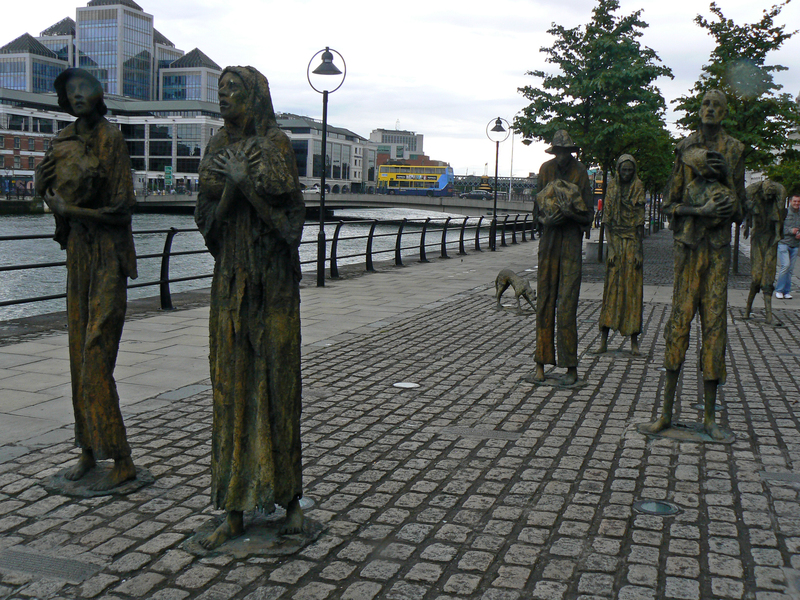 The Famine Memorial in Dublin, in contrast, conveys an image of starvation, hopelessness, and tragedy. Who are these people? Where are they from? Where are they going? Will they even make it there? Their bodies are emaciated, their faces vacant. They show no signs of anger or resistance. It is a representation of the starving poor of Ireland leaving their country while food is also exported from along the same quays. Though it draws on nationalist sentiments similar to those found in North America, unlike its counterparts this memorial contains no suggestion of positive opportunity or triumphalist vision for these people. However, its proximity to the ‘World Poverty Stone’ does relate to the message emphasized by Mary Robinson during her presidency and in her speech at Grosse Île in 1994, that we should recognize the connection between human suffering in the past and that in the present. She said we must choose between being ‘spectators’ or ‘participants’, between separating ourselves or being compassionate and involved. She rejected any moral distancing or dispassionate analysis, instead choosing to see the human element of the past and to understand it in contemporary terms. These physical memorials each in a sense embody the ethos of the time and place that produced them and its historical memory of the event. Overall they suggest that for those in Ireland, the Famine continues to evoke memories of shame, hopelessness, and suffering, and while people such as Mary Robinson have, after 150 years, come to use it as a lesson for the present, that has not changed the persistent image in national consciousness. The memorials in Canada and America suggest a very different type of historical memory: for members of the Irish diaspora the Famine was not just a tragedy to be commemorated, but one from which they rose despite hardships, their creation story. These latter memorials contain a greater sense of optimism, a reminder of how far they had come. While the Irish nationalist historical narrative on both sides of the Atlantic used the Famine as proof of British misrule, the story of its casualties has gone down divergent paths. Ian McBride, ‘Memory and National Identity in Modern Ireland’, in I. McBride (ed. ), History and Memory in Modern Ireland (Cambridge University Press, Cambridge, 2001), p.41. Michael Quigley, ‘Grosse Île: Canada’s Famine Memorial’, in A. Gribben (ed. ), The Great Famine and the Irish Diaspora in America (University of Massachusetts Press, Amherst, 1999), p.150. Ruth-Ann M. Harris, ‘Introduction’, in Gribben (ed. ), The Great Famine and the Irish Diaspora in America, p.12. RTÉ, Blighted Nation [radio programme], Episode Four, January 2013. For a longer discussion and interpretation of the Irish Hunger Memorial in New York see: Marion Casey, ‘Exhibition Reviews: The Irish Hunger Memorial, Battery Park City, New York’, Journal of American History, vol.98, no.3 (2011), pp.779-782. Kerby Miller, ‘“Revenge for Skibbereen”: Irish Emigration and the Meaning of the Great Famine’, in Gribben (ed. ), The Great Famine and the Irish Diaspora in America, p.185. Kevin O’Neill, ‘The Star-Spangled Shamrock: Meaning and Memory in Irish America’, in McBride, History and Memory in Modern Ireland, p.118. In: Peter Gray, The Irish Famine (Thames & Hudson, London, 1995), pp.182-3. Update 19 June 2014: for further reading also see Emily Mark Fitzgerald, Commemorating the Irish Famine: Memory and the Monument (Liverpool University Press, 2013) and Margaret Kelleher’s lecture ‘Hunger in History: Monuments to the Great Famine‘ and article of the same name in Textual Practice, vol.16, no.2 (2002).